So I woke up in a panic this morning, remembering that I hadn’t written this week’s installation. I usually begin writing it Sunday, but if you followed the posts on Twitter…the last 48 hours were really busy and crazy. 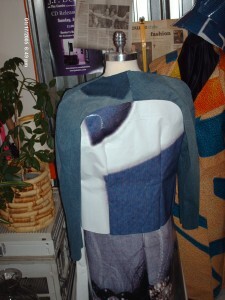 Last week I mentioned the pant leg of the recycled jeans were not large enough for the pattern piece. Well, I come from the school of thought “If there is a will – there is a way!” I finagled the pattern piece, and cut it in a way that the compromised portion would be in the seam allowance. 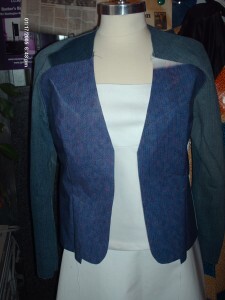 As the jacket is evolving, there are some things I will do a little differently next time. For instance, I will take the time to dye the denim or give it some type of treatment, to give it a less “patchwork” look, but I still like how the shading in the denim plays with the modeling of the vinyl. The good news is, I have a dress 95% completed (you will have to wait to view it with the completed collection), this jacket will be done by Friday and the contest I want to submit these items to, has granted an extension for submissions. WooHoo! Talk to you next week or get the day-by-day saga, on twitter.com/SoHoExchange. This entry was posted on Tuesday, December 8th, 2009 at 2:21 pm	and is filed under News, Products. You can follow any responses to this entry through the RSS 2.0 feed. Both comments and pings are currently closed.